One of the EASIEST ways to give back to your schools. 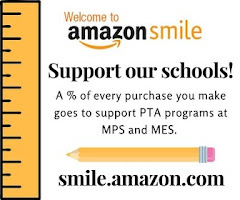 By going to smile.amazon.com, a portion of your purchases will then be given back to MPS and MES PTA! Questions about Amazon Smile can be found on their website. 1. Go to smile.amazon.com whenever you want to purchase something on Amazon. That's it! Going forward you will not have to do these steps again. Just make sure you go to smile.amazon.com to make your purchases and our name is always displayed at the top. Thank you for support your PTA!